Dr. Larry Chamberlain of the Eagle Commission has announced the welcome of a new chaplain, Lt. Col. George Youstra, to the ranks of Grace Brethren military chaplains. 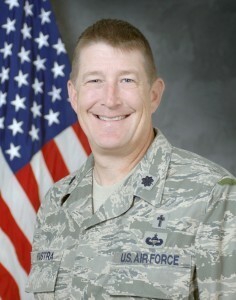 Chaplain Youstra serves as Wing Chaplain at Beale Air Force Base in California. He is a member of the Brighton Chapel Grace Brethren Church near Howe, Indiana. According to information supplied by The Eagle Commission, Youstra is responsible for ensuring religious freedom and accommodation for the 4,500 military personnel stationed at Beale AFB. Before arriving at Beale, Chaplain Youstra directed the Character and Leadership programs at the U.S. Air Force Academy in Colorado Springs, where he developed and rewrote the entire Character and Leadership curriculum for more than 4,000 Academy cadets. A native of Greenville, South Carolina, Chaplain Youstra spent the first 14 years of his military career in the U.S. Army, where he served as a Special Forces, Infantry, Military Police Officer and Chaplain. He has been an Infantry Company Commander, Special Force Detachment Commander & Battalion Chaplain. Chaplain Youstra entered the Air Force Chaplain Corps in 1998. He has been deployed to Iraq and recently returned from Afghanistan, where he supervised the largest Air Force chapel staff in the country and the Combined Joint Theater Hospital chapel staff. Chaplain Youstra is married to the former Rose Workman of Normal, Ill., and they have two sons. He plans to attend the Chaplains Appreciation Dinner at the FGBC National Conference in Wooster, Ohio, this July and is eager to meet both his fellow chaplains and others from the FGBC.